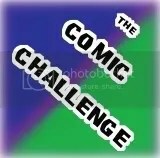 That’s r ight, I’m hosting a comic challenge for the whole of a year instead of just two months! Don’t worry, I won’t be bombarding everyone with comic reviews, especially after the last couple of months. Even I need a break after that, but I will be reviewing comics/graphic novels on a monthly basis or at least I plan to. If you’re interested click on the banner to take you to the challenge page and you can sign up there (all you have to do is create a sign up page, link back to that with the Mr Linky, grab the code for the banner and place it somewhere on your blog or social network profile). I am going to aim for Zoink! which is 15 comics/graphic novels to read over the year. I may go over and probably will, but I’ll aim small just in case. You know, growing up, I never read any comics. Today I read my first graphic novel and I liked it. =) I loved the Scott Pilgrim movie, so I’ll have to check out the comic. I’ve heard the Sandman series is awesome.